For years now, Sun Dolphin has been manufacturing quality kayaks. Today, we’re going talk about one of their most popular models – the Aruba 8 SS. In this Sun Dolphin Aruba 8 SS Kayak review, we are going to try to give you an overview of the vessel and in turn, help you make a purchasing decision. Here is a quick recap on what we think of this kayak. For starters, tracking and stability are two of the most important features of any personal vessel. And this particular kayak has a very narrow stern and bow. The V-shaped hull allows it to drift through the water when paddling. Instead of pushing water – like many bluntly-designed vessels do – it slices it. That allows you to keep it on track with ease. Some inexperienced paddlers may find it a bit difficult to steer due to the lack of foot pegs. But the kayak responds pretty well to body gestures, plus it can take turns easily with the help of proper paddle placement. Even if you don’t have much kayaking experience, you’ll be able to master steering in a matter of days. Also, being 28 inches in width helps the stability and steering of the Aruba 8. As we mentioned above, this is certainly a well-designed kayak. It has enough room for your body and legs, plus it’s equipped with a comfortable, padded seat. The seating space also has shielding thigh pads that will help you avoid skin irritations. The high back support is also there to keep you in a comfortable position while paddling. Check out the video below. The adjustable foot braces are the second feature we need to talk about. They don’t offer just additional comfort, but also a good way to improve your pedaling efficiency. 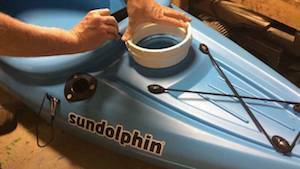 You can also take advantage of them and modify this Sun Dolphin SS kayak to accommodate people of different sizes. These braces are fully adjustable, which means that your wife, children, or any other family member can benefit from them. While this doesn’t really fall into the “comfort” category, since we’re talking about the overall design, we should mention the colors. This 8-foot fishing kayak is available in a wide range of colors. Some of them include red, blue, green, and yellow. Basically, it comes in a variety of vibrant colors that others can easily spot, which can be very helpful if you accidentally get lost. If your wife is looking for a more comfortable option, check out this review on the best kayak for women. Although our review has been completely positive up to this point, we have to admit that the one area in which it lacks is storage. Compared to other kayaks in the same price range, the Aruba 8 doesn’t have quite as ample storage. On a more positive note, you have two bungee cords on the front that can hold anything from coolers to backpacks. It has a waterproof hatch on the front end, where you can place all the essential items that need to stay dry. We’ve already established that this is a kayak for beginners. If you’re an inexperienced paddler, your kayak will probably take on a lot of water the first few times you take it out. If you’re planning to take your phone on the trip, you should take full advantage of the hatch to ensure your only way of communication stays dry for the duration of the trip. We have to say, in terms of portability, the Aruba 8 is simply amazing, especially when you compare it to other kayaks in the same price range. After a few hours of paddling, carrying a kayak back to your vehicle can seem like a full-blown military drill. However, with this kayak, you won’t have to worry about straining your muscles from carrying it. The haul weighs only around 44 pounds, so naturally, an adult can carry it with one hand. 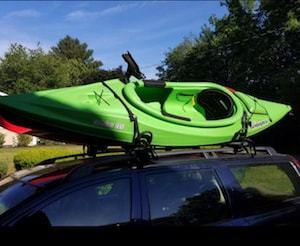 The low weight gives it a level of maneuverability only seen in much more expensive kayaks. Lastly, the vessel is equipped with handy carrying handles that give the paddler more comfort while loading it onto their car. And due to the placement of these handles, you can actually carry the Aruba 8 all on your own. The Aruba 8 is light enough for a teenager to pick up and load onto a truck. That means that no matter your size, you probably won’t have any problems transporting it from your home to the wilderness. The adjustable seat allows you to adjust it just enough to be pretty comfortable for long rides. While the paddle is not perfect by any means, it’s still light and perfect for a beginner. The stability allows you to get in and out without any problems. And it would be more than difficult to roll the Aruba 8 on the water. 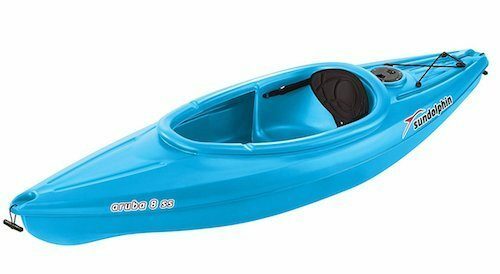 Editor's Note: The Aruba SS 8 is a great kayak for beginners who are looking to improve their paddling skills. With all its supportive features, you will definitely have a good time while practicing. The kayak is pretty light and a single person can easily carry it. Due to its shape, the kayak is surprisingly fast. It’s great for beginners who are trying to learn how to paddle. The price tag is low considering all of the aforementioned features. There is no access hatch for the rear storage. Drain holes are too far away from each other. The seat is not padded, so you need to get a pillow. 1. Does it have any additional accessories and features? On the surface, the Aruba 8 looks like a plain-old, feature-less kayak, but that’s not the case. The kayak is actually hiding some additional features. For starters, it has two mounted rod holders. 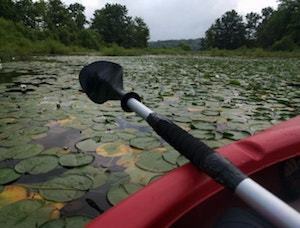 If you are a fishing aficionado, you’ll be delighted by this feature that allows you to transform a seemingly ordinary kayak into a fishing one. One of the best Sun Dolphin Aruba 8 accessories is the bottle holder, which allows you to keep your water near you at all times. We can’t forget about the “spray deflectors” that let you take the vessel into a rapid river without worrying about taking on massive amounts of water. 2. What material is it made of? When purchasing a kayak, this question is crucial for some people. Fortunately, the Aruba 8 is made of HDPE (or High-density Polyethylene). This material is mainly used for pipes, so you know it’s durable and sturdy. In short, the kayak will survive most underwater obstacles and even a run-in or two with bigger rocks. Depending on the size of the rock, the outer shell may dent a bit. However, a full-blown breach is basically impossible. And you shouldn’t worry about the possible dents because they are easy to repair. Also, the kayak comes with a two-year warranty, so you shouldn’t worry too much about possible repairs. 3. What kind of water can you use it in? Although the Aruba 8 is primarily designed to be used on lakes and rivers, it goes above and beyond its duty. That means that you’ll be able to keep it stable even in difficult weather conditions. Plus, you can even take it and try it out in the ocean. Lastly, we should point out that the large cockpit allows the paddler to get in and out quickly. So, in case you fall into the water, there’s almost no chance of getting trapped inside the vessel. In fact, in case of an emergency, you’ll be able to slide out of it in less than five seconds. When it’s all said and done, the Aruba SS is a great kayak for beginners who are looking to improve their paddling skills and have a good time while doing it. Furthermore, if you’re looking for a recreational kayak that tracks well and is easy to get to the water’s edge, this should be the perfect one for you. However, the kayak is only good for short trips. If you want something that will allow you to carry a few days-worth of equipment, you should definitely look elsewhere. But if you enjoy an occasional all-day camping trip, you shouldn’t hesitate to buy the Aruba 8. Trust us – you won’t regret it. We hope you enjoyed our Sun Dolphin Aruba 8 SS Kayak review and that it will help you with your choice. As always, if you have anything to add to the conversation, feel free to share your opinion with us by leaving a comment in the comment section below.